Any government permitting the promotion of usage of a product that when used as intended has a scientific certainty of killing its citizenry1 is not aiding and abetting "free markets"—at best it's aiding and abetting negligent homicide; at worst its guilty of mass murdering its citizenry. Scientific process and progress can be expected to routinely and sometimes rapidly render products harmful or deadly—it's a perverse national or international legal system that permits or enables scientific process and progress to promote products that when used as intended kills its citizenry2, 3. "The amount of healthcare expenditure due to smoking-attributable diseases totalled purchasing power parity (PPP) $467 billion (US$422 billion) in 2012, or 5.7% of global health expenditure. The total economic cost of smoking (from health expenditures and productivity losses together) totaled PPP $1852 billion (US$1436 billion) in 2012, equivalent in magnitude to 1.8% of the world's annual gross domestic product (GDP). Almost 40% of this cost occurred in developing countries, highlighting the substantial burden these countries suffer. Smoking imposes a heavy economic burden throughout the world, particularly in Europe and North America, where the tobacco epidemic is most advanced. These findings highlight the urgent need for countries to implement stronger tobacco control measures to address these costs." Our government must continue its creative efforts to drive smoking prevalence in the United States well below 12%, preferably zero. UPDATED 11/03/2016 COSMIC, Signatures of Mutational Processes in Human Cancer and Nature, Signatures of mutational processes in human cancer (2013) A primer article on base pair signatures. UPDATED 09/09/2015 MedNews, What is nicotine? Pictures and pictograms are important in countries whose development has not yet achieved sufficient educational attainment. It's not without significant irony that the same economic system capable of propelling a nation's development is also capable of propelling a nation's demise, if or when incorrectly operated and managed. Our nation has signed the Framework Convention on Tobacco Control but Congress has not, yet ratified it. Our Congress may be applying its bizarre and delusional "Exceptional America" logic to justify its failure to ratify this important international framework? An undesirable effect of our economic model is it encourages the development of products or services, which leverage externalities for illusory or negative profits. It is important that policymakers neutralize or eliminate all externality incentives, before products or services are placed in the streams of commerce. Kudos to the FDA and those working hard to neutralize or eliminate all externalities associated with the harmful and addictive products contained in cigarettes. Is it true that those who have their head in their "shithole", appoints those who have their head in their "shithole", appoints those who have their head in their "shithole"...who think having their head in a "shithole" is the "new" normal? Brazen economic entities that insert addictive tobacco products into the stream of commerce, which when used as intended kills our citizenry with scientific certainty should expect imminent bankruptcy. Tobacco corporations must stop producing these tobacco weapons, which kills our citizenry when used as intended! Our government and citizenry must increase their efforts to end these destructive tobacco weapons for our society, including ending all economic incentives for trafficking in these harmful tobacco weapons. Stated differently our society must make sure all tobacco entities and those profiting from those entities (e.g. pension plans, share holders, banks etc.) go bankrupt mitigating the harms they inflict! It is criminal for our leaders to spend decades defending corporations before launching initiatives to end tobacco products. It is necessary, but insufficient to run decades late ads correcting for such a deadly disinformation and misinformation campaign against our citizenry, which our leaders aid and perpetuate to this day! • Smoking kills, on average, 1,200 Americans. Every day. • More people die every year from smoking than from murder, AIDS, suicide, drugs, car crashes, and alcohol, combined. • Smoking causes heart disease, emphysema, acute myeloid leukemia, and cancer of the mouth, esophagus, larynx, lung, stomach, kidney, bladder, and pancreas. • Smoking also causes reduced fertility, low birth weight in newborns, and cancer of the cervix. • When you smoke, the nicotine actually changes the brain – that’s why quitting is so hard. • Many smokers switch to low tar and light cigarettes rather than quitting because they think low tar and light cigarettes are less harmful. They are not. • Low tar” and “light” cigarette smokers inhale essentially the same amount of tar and nicotine as they would from regular cigarettes. • All cigarettes cause cancer, lung disease, heart attacks, and premature death – lights, low tar, ultra lights, and naturals. There is no safe cigarette. • Altria, R.J. Reynolds Tobacco, Lorillard, and Philip Morris USA intentionally designed cigarettes to make them more addictive. • Cigarette companies control the impact and delivery of nicotine in many ways, including designing filters and selecting cigarette paper to maximize the ingestion of nicotine, adding ammonia to make the cigarette taste less harsh, and controlling the physical and chemical make up of the tobacco blend. • Secondhand smoke causes lung cancer and coronary heart disease in adults who do not smoke. • Children exposed to secondhand smoke are at an increased risk for sudden infant death syndrome (SIDS), acute respiratory infections, ear problems, severe asthma, and reduced lung function. • There is no safe level of exposure to secondhand smoke. This is fantastic news, it's becoming "cool" to not smoke! Hopefully the trends will soon near zero. Kudos to our young adults for their reduced usage of cigarettes and other smoke products! Those selling tobacco products must continually pay for ALL the costs this toxic mobile menace has and is inflicting on our nation. Yes, even the cost of so-called "nicotine replacement therapy" products containing "little or zero nicotine" (i.e. 0-6 mg of nicotine). Who would have guessed that our corporations are incapable of self-regulation without strong oversight and enforcement? 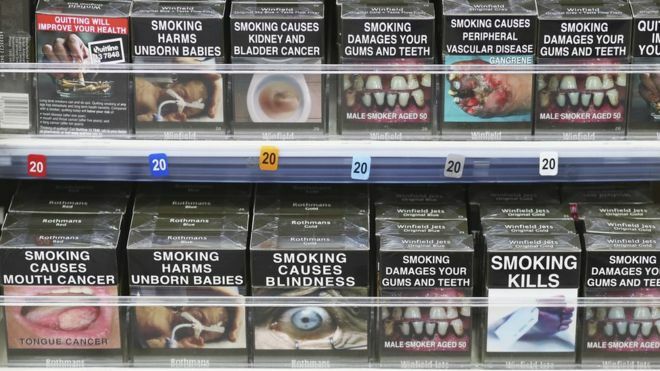 "Tobacco giant Philip Morris has been ordered to pay the Australian government millions of dollars after unsuccessfully suing the nation over its world-first plain-packaging laws." UPDATED 05/22/2017 MedPress, Doctors urge FDA to tighten regulations on 'filtered' cigarettes Our nation's cigarette tragicomedy continues—researchers accumulate sufficient evidence to plug the holes on cigarette filters! Smokers of insidious e-cigarettes exhale massive clouds of toxic aerosol into our atmosphere, which others unwillingly inhale to the detriment of their health. Shame on Representative Duncan Hunter (R-CA 50th District) for sacrificing his constituents' health for campaign contributions from big-tobacco (e.g. Reynolds American Inc. PAC)! FDA is rightly focused on protecting the health of our citizenry not the campaign contributions of our corrupt politicians! Kudos to San Francisco Board of Supervisor Malia Cohen on proposing a ban on flavored tobacco products (should be all tobacco product), ignoring the usual canard that United States alcohol prohibition is predictive for publicly banning tobacco products. Impediments to tobacco products are significantly helpful for all but our most addicted (i.e. steepest price elasticities) users. Medical and behavioral options can help even our most addicted users quit this singularly deadly* product. * A human biologically beneficial level of a tobacco product, like ionizing radiation does not exist! In fact cigarette smoke contains the harmful ionizing radiation, Polonium 210. A person subjecting another non-smoking person(s) to any cigarette smoke is abusing that person(s). It's not clear why there is not a total ban on publicly using all aerosol producing tobacco products? We ban public activity that is much less harmful than tobacco smoke! Why must anyone publicly walk, run, push a stroller, ride a bicycle or dodge the oblivious miscreants' toxic and extraordinarily harmful smoke plumes? Our nation must lead the way to zero tolerance for using all tobacco products, not just support for the five measures of the WHO framework (i.e. high tobacco taxes, smoke-free public spaces, warning labels, comprehensive advertising bans, and support for stop smoking services). UPDATED 02/18/2017 AsapScience, What Happens When You Stop Smoking? and DNews, What Is Thirdhand Smoke And How Dangerous Is It? Smokers are mini mobile toxic waste dumps, even when they're not smoking. Just another reminder how deadly cigarettes and government duplicity in both promoting and proscribing even low dosage tobacco use. The cellular damage to human organs resulting from tobacco smoking is ubiquitous! Until clinical medicine is able to reliably block an individual's molecular addictive pathway(s)7 related to nicotine, tobacco usage will be a difficult habit to "kick"...but stopping is possible, even if it requires repeated attempts over prolong periods of time. Tobacco smoke has ionizing Polonium 210, which has a half-life of about 138 days, alpha decaying to stable Lead 206. Submariners and others should avoid tobacco smoke as if it were ionizing radiation. Also, it's worth noting that smoking impairs the molecular mechanisms that routinely repair our intercalated DNA helical base pairs (mutations), which prevents normal cellular DNA replication (see above article on mutational signatures associated with tobacco smoking). Bleated pleas and threats from producers of products that fatally harm our citizenry in the name of employment are not new. The response is as simple as it is direct, develop and manufacture products, which benefit our citizenry, not that kills them! UPDATED 10/27/2016 Medline, 3 in 4 Teens Think E-Cigarettes Safer Than Tobacco: Survey Obama administration delays attempt to regulate flavored e-cigarettes. "The protein, called the α4β2 (alpha-4-beta-2) nicotinic receptor (3D imaged using Argonne's beamlines), sits on nerve cells in the brain. Nicotine binds to the receptor when someone smokes a cigarette or chews tobacco, causing the protein to open a path for ions to enter the cell. The process produces cognitive benefits such as increased memory and focus but is also highly addictive." Kudos to our researchers who patiently pursue the difficult basic research, which enables us to fundamentally understand problems vexing our nation and citizenry. Those manufacturing products must conduct such basic research before6 injecting toxic, addictive, and deadly products into our global commerce streams. Evidently, big tobacco is incapable of constructively producing products beneficial to civil society? Perhaps, a law that revokes its ability to respond in federal courts resulting in default judgments for the harm its products produce will make sure it ceases producing harmful products? Similar to revocation of a nuisance litigant's ability to file lawsuits, but with damages attached. Alternatively, our citizenry can vote to impose taxes (i.e a form of liquidated and ascertained damages) on its products proportional to the harm it is and will inflict on civil society? Cigarette smoke has toxic particulate that requires strict regulation to make sure it never involuntarily impacts another person. A reminder of how imperfect (some might say criminally negligent 5) our government can be when promoting the general Welfare of our present and future citizenry (see U.S. Constitution). The absurd notion that a smoker lacks will power to quit because they cannot stop smoking on the first attempt likely hinders or prevents many smokers from quitting. It may take many more than 30 attempts before quitting this highly addictive and deadly habit! It is retrogressive, misguided, and malevolent tax policy that permits or enables any investment in a product, which has a scientific certainty of killing humans to be profitable. A corporation producing any product that has a scientific certainty of harming people when used as intended (e.g. tobacco products) must expect comprehensive prophylactic government regulation throughout its (products and corporate entity) entire life cycle. It's unclear how our corporations learned that they can freely produce otiose and odious products as a matter of right—clearly the expectations for our 21st century corporations need to dramatically increase! Somehow a corporation learned it can dump a product into the stream of commerce and forget about it, until sued, ad nauseam for incremental damages, while their product(s) continues harming people! Corporations must transparently and publicly account for its product(s) in perpetuity or until all instances of the product(s) no longer exist, including all existing or future harm. UPDATED 03/28/2016 ACS, Cigarettes Cheaper than E-cigarettes in 44 of 45 Countries Studied Oft touted reason for switching a nicotine addiction from cigarettes to e-cigarettes is unsupported by the data. The law is one of the many tools that governments on all levels (municipal, state, federal etc) should constantly and creatively deploy to minimize the direct and indirect baleful human impacts of tobacco usage. How many of our citizens will die before this "free-market-product" becomes intolerable like its sibling free-market-product, cigarettes (i.e. mobile source of toxic and hazardous pollution)? It's difficult to take seriously a First (speech clause) or Fifth (taking clause) Amendment challenge to our government's efforts to curtail or eliminate the usage of a product that kills so many of our citizenry. Surely, a nation's toolbox includes tools short of declarations of illegality, which directly impact interests in a deadly product? Stated differently, declarations of illegality are not a condition precedent to subsequent actions that may impact an interest in a product subsequently discovered to be deadly. No need to await decades of accumulated health issues before challenging the promotion of products with a significant likelihood for negatively impacting human health. UPDATED 12/01/2015 SFGate, Which counties smoke the most in the Bay Area? "There is no safe level of secondhand smoke." "The strongest thing that people can do to affect their future health in terms of COPD and also smoking-related disease like cancer and heart disease is to stop smoking." "Everybody now knows how people can be persuaded to stop smoking. So all countries should be doing it"
It's important, as nations' public health specialists roll-out these "hard-hitting" adverts, to recall the nefarious and baleful history of tobacco—The history of the discovery of the cigarette-lung cancer link: evidentiary traditions, corporate denial, global toll, Big Tobacco knew radioactive particles in cigarettes posed cancer risk but kept quiet, List of cigarette smoke carcinogens (which excludes several thousands of chemicals in cigarette smoke whose biological interactions still require elucidation). Unfortunately, the tobacco industry related infliction of misery and mayhem does not end with the hundred of thousands smokers who die each year. Perhaps if our corporate containers possessed the anthropomorphic attributes our Supreme Court has assigned them the inflicted misery and mayhem would cease accumulating over decades, along with the mob-like interest on financial instruments commonly referred to as capital accumulation bonds. Public comment on the proposed extension of authority begins April 25, 2014. It seems amazingly absurd that any 21st century civil society structure would enable its manufacturers of any product to use its citizenry as laboratory rats for the safety testing of that product. Particularly if that product has an uncertain but related status as a substitute or complement for any product that kills to a scientific certainty when used as intended (e.g. tobacco products). Opponents to governments' efforts to demote cigarette smoking by our citizenry often selectively use the curious concept of "freedom to [insert activity]", but fail to exposit this freedom within a context of "scientific certainty". Often their explanations or logic simply substitute or incorporate a plethora of unchallenged personal and cultural myths, assumptions and assertions. Some governments not only ignore "scientific certainty" but completely blow-up science by ascribing anthropomorphic attributes to an inanimate corporate object, then "reason" that our government cannot constitutionally demote cigarette smoking because demotion infringes the ascribed anthropomorphic attributes. It's truly bizarre when the living anthropomorphize the dead, which proximately kills the living, to a scientific certainty! It seems worth noting that our restaurant sector has not historically provided healthcare insurance or the wages necessary to purchase healthcare insurance. Perhaps, just another example of our accumulating market failures that will be ameliorated by our Affordable Healthcare Act and eliminated when our citizenry have universal healthcare. UPDATED 07/26/2013 Economist, No Butts Some country per capita smoking percentages. Baleful cigarette weaponry continues to menace, molest, mutate, maim and collaterally kill members of our civil society while our judiciary considers whether requiring prominent pictograms on "product packaging" is permissible. You can't make this stuff up! Evidently, pictures and pictograms are important to smoking cessation in countries whose development has achieved sufficient educational attainment, too! UPDATED 08/25/2012 Reuters, U.S. court strikes down graphic warnings on cigarettes It seems odd that any legal system would endowed a corporate entity with commercial speech rights4—it seems positively perverse for our legal system to then use those commercial speech rights to enable our corporations to promote a highly addictive product that has a scientific certainty of killing our citizenry when used as intended! Hopefully, our Supreme Court will reverse R.J. Reynolds Tobacco Company v. FDA (pdf)—surely the odd concept of corporate commercial speech developed and used by our U.S. Supreme Court does not include the right to produce and promote a highly addictive product that has a scientific certainty of killing our citizenry when they use this product as intended3! Some legal decisions can cause an uninitiated reader to wonder if its author isn’t really a toddler hilariously answering a question that has overwhelmed their still developing conceptual capacity. Surely the court is not saying that if industry can produce a lethal product sufficiently addictive that death precedes usage cessation our government cannot emotionally, experimentally, or otherwise require or compel graphic images for the purpose of prompting, promoting or provoking usage cessation short of death. "...FDA has not provided a shred of evidence—much less the “substantial evidence” required by the APA—showing that the graphic warnings will “directly advance” its interest in reducing the number of Americans who smoke. FDA makes much of the “international consensus” surrounding the effectiveness of large graphic warnings, but offers no evidence showing that such warnings have directly caused a material decrease in smoking rates in any of the countries that now require them...."
Our FDA is acting under the Family Smoking Prevention And Tobacco Control legislation, which aims to prevent smoking and promote its cessation, without expressly banning tobacco products. "...The WHO says tobacco already kills around 6 million people a year worldwide, including more than 600,000 non-smokers who die from exposure to second-hand smoke." 1. Weaponry used in warring is the promotion of usage of a product that when used as intended has a scientific certainty of killing other nation's citizenry—should an exported cigarette be characterized as weaponry? 2. It seems useful to note that if no nation operated a perverse legal system then "its citizenry" could be changed to "human beings". 3. The rapidly developing field of genomics and related fields will likely routinely demonstrate to a scientific certainty that a product is harmful to human beings—corporate commercial speech rights, however interpreted by our U.S. Supreme Court must not enable mischief to that scientific process and progress. 4. Corporate entities are inanimate objects created and chartered by governments—speech is typically not an attribute one associates with inanimate objects—much less constitutionally protected speech that its creator or charter cannot alter. This ruling should not prevent the subsequent assertion of criminal and civil logic, which continually holds "big tobacco" responsible and accountable for all harm their activities (both territorial and extraterritorial) inflict. 6. Some might argue that "Big Tobacco", in addition to perpetually paying for all the harm their product continues to inflict must fund the basic, applied,and clinical research, which will help every addicted tobacco users to precisely and exclusively block nicotine's cell porin pathway action.